Cover is over there on the right, and now you know about as much about it as I do. Okay, those characters on the top half of the "H" appeared on the backcover of AVENGING MIND, and the hero might be named "Agent of Justice", or that might just have been a description. Still, new Ditko comic book stories, for the first time this century (discounting that New Gods temporal anomaly). Ordering info for this and earlier Snyder/Ditko publications at the usual place. Well, my copy came in the mail last night. Enjoyed it very much. 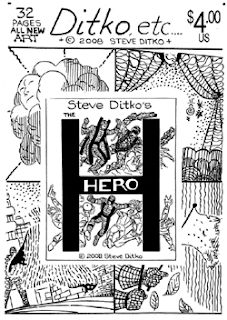 The character on the front is "Hero". that's his name. A lot of real short items (one sheeters, or 2-3 'story'). Basic stuff, not really deep. But promises of further work along this line.